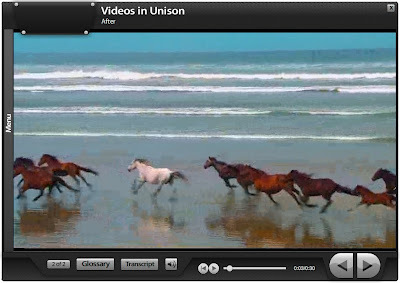 Our customers often notice that videos that are uploaded to Unison courses always appear the same size (and usually not the original size) in courses. 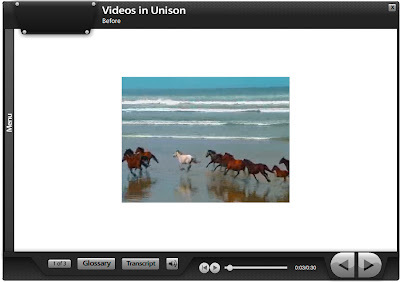 Unison allows you to upload videos in .flv, .mov, .avi, or .wmv format. All video types (except .flv) must be converted to .flv before they can be used in courses. When this conversion occurs, Unison changes the size of the video to fit in the video page template. By uploading a video that is already the size you want in .flv format, you can bypass the conversion process. This allows you to incorporate a video in it's original size, or you could design a video to take up the entire staging area of the video template. 1. Course Style Size: You will need to look up the staging area dimensions of the course style you are using so you know what size your video needs to be. You can look this up on our wiki. Look up the name of the style you are using for the course. The staging area is the number in parenthesis. 2. Video Size: Now that you know the dimensions for the staging area, you can change your video dimensions to match. You will need to use a video editing tool or converter to change the size. If you don't currently have a tool, you can download a free trial of the "Any Video Converter" here. 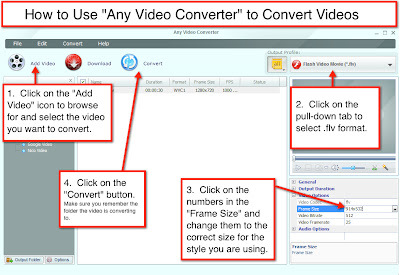 For steps on how to use "Any Video Converter," see the instructions on the image below.